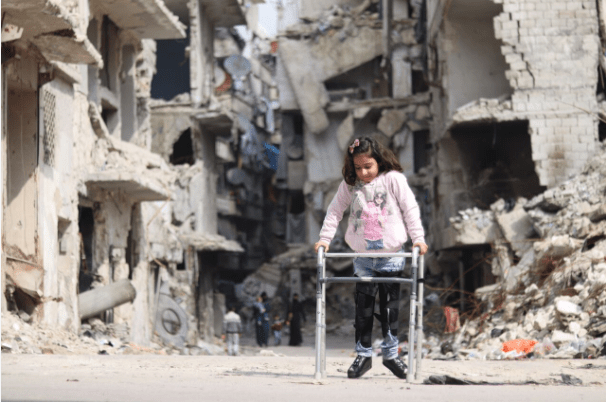 Rama, 8, walks using a walker, in her neighborhood in eastern Aleppo. Little Rama, now eight, has grown up knowing nothing but war. When she was only a toddler, her family was forced to flee their home in east Aleppo as violence escalated, moving from one area to another. Rama was only five years-old when a shell hit the mosque where her family was sheltering in Aleppo. That day her spine was severely injured and she lost her ability to walk. Rama spent her days isolated from her friends and three siblings, lying down on a thin mattress in the dark. But Kafa refused to see her daughter give up on life. She made it her calling to help Rama regain her confidence and be a child again. “My mother used to place my feet on the ground and carry me through a full game of hopscotch so I could play with the other children in the mosque’s courtyard,” says Rama, glancing lovingly at her mother. Last year, amid a respite in violence, Rama and her family moved back to their home in war-ravaged east Aleppo. Even though it was damaged in the fighting, Rama and her siblings were ecstatic about having a home of their own. “Mother! We have our own kitchen and bathroom, we don’t have to share a bedroom with many people!” says Kafa, mimicking what her children used to tell her, with an expression that is a mixture of relief and sadness. Rama was especially happy to be back home. Rama started physiotherapy very soon after the attack. But the cost of the therapy and the medicine she needed proved too costly for her family. Her father who works as a house painter does not have a regular income. But last year, Rama’s family was one of over 6,000 families to receive monthly cash assistance from UNICEF, to support families of children with complex disabilities. The cash assistance paid for Rama’s physiotherapy sessions and medicine. Since the start of this year, UNICEF has faced funding constraints, meaning that Rama’s family has not received the cash assistance. As a result, they are unable to pay for her regularly. Rama has made great improvements through physiotherapy. She is now able to sit up straight and walk short distances with the help of a walker. The rest of the time, she uses a wheelchair to get around. “It takes me too long to walk for a very short distance and my arms hurt sometimes when I use the walker,” says Rama, whose every step, movement or slight improvement is met with loud cheers and encouragement from her family. “When I took my first step, I was scared that I would fall, but that fear is gone now,” she adds with a smile. Despite everything she has been through, Rama is determined to continue her education and wants to become a pediatrician in the future. She attends 2nd Grade in a school in east Aleppo but sometimes has to miss class to attend her physiotherapy sessions. Rama is also determined to walk again and daydreams about when that day will come. “One day, I’ll go to the park with my family, and will race all the children there and win!”. 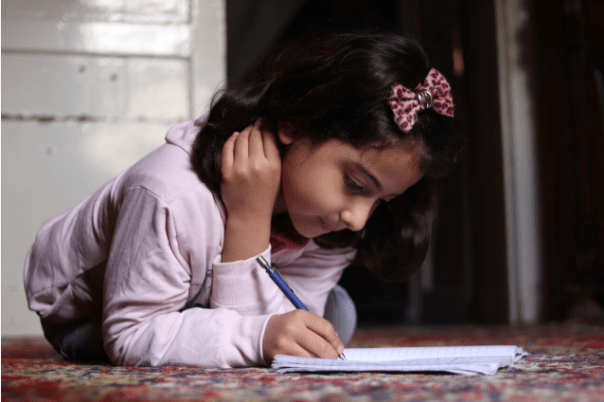 Rama, 8, writes a letter in her home in Salaheddine neighbouhrood in eastern Aleppo. The letter is addressed to children in Germany, in which she tells them about her life. My name is Rama Hashoom, I am 8 years old, from Aleppo city. Because of war, I left my home with my family five times. We went to live in rural areas, schools or mosques that were turned into shelters. I was playing with my friends at the mosque when a bomb injured me, it wounded my back. I couldn’t walk again. I felt sad because I couldn’t go to school like my friends. Now, I feel scared every time I hear a loud sound. After six years of displacement, we went back home. I felt happy because my home is the place where I had my first steps. It is a place full of love and warmth. My family helps me go to school. I wake up at seven, I drink a glass of milk then I go with my sisters Safaa, Sana and my brother Ahmed. My mother helps me up and down the stairs. I love going to school every day to learn and meet my friends Leen and Khadijah. We have fun together. I like maths because it is the world of numbers and it is easy to learn. When I come back home, I do exercises for my legs and then study. I hope I can walk again to help my mother and return the favor. I love studying and I want to be a pediatrician when I grow up. I love children and I don’t want any child in the world to be sad.